ER stands for entity relationship that helps in organizing and storing the data in a database. The stored data is in the form of different entities that defines the relationship between each entity. Peter Chen developed the concept of ER diagrams in 1976. Chen’s innovative work started a new arena of research and practice known as conceptual modeling. The entity relationship model serves as the foundation of various system analysis, repository system and computer-aided software engineering tools. Data models are easy to understand and it is a means of visualizing how information produced by a system is related to each other. An entity relationship diagram looks like a flowchart as it contains specialized symbols and its meaning that makes it more unique. Objects such as entities and relationship sets can be represented with the help of an ER diagram. An entity relationship diagram is also called an entity-relationship model that reflects the graphical representation of entities and their relationships with each other. Below are the various relationships between the entities. One to one : One case of an entity is related to the another case of other entity. Like, worker (A) is allied with the only one security member (B). One to many : One case of an entity (A) is related to one or many cases of another entity (B), but for one case of entity B there is only one case of entity A. Many to many : One case of an entity (A) is related with one or many cases of entity (B), and one case of entity B is related to one, or many cases of entity A. Though ER model looks as simple diagrammatic representation, but it is intricate in nature as it involves a clear understanding of data flow. Moreover, an ER diagram also shows a graphical representation of the design that makes difficult for the students to understand its complex structure. Furthermore, the newly enrolled students want to run away from this topic due to several technical terminologies associated with it. If a student is all confused with the concept, it would create a drastic problem in designing the ER diagram as the materials available on the internet are also of no help in such a case. Also, ER diagram is specially designed for an advanced level design that too confuses some students and it results in their poor performance. Nowadays, academics these days are also demanding and challenging that wastes most of the students crucial time. Amongst these situations dealing with the topics like ER diagram and related homework is tricky and problematic. To cope up with these problematic situations, EssayCorp provides the best professional guidance on database assignment writing for students on all the topics related to it. With the team of experts, students can get the expert help and can get rid of all their complications regarding this topic. In a subject so vast and extensive, it gets tough to pay attention to every minor detail. We at EssayCorp assist you to cognitively move forward in your academics by scaling up your knowledge levels through our meticulous assignment structure. We understand what an ER diagram Project needs and hence, we provide you with specialized custom made ER diagrams. Our assignment help is designed especially to make you understand the essentials of the topic and thereby broadening your insights on it. Exceptionally talented in solving assignments in the field to make students clear from every typical terminology. They believe in a multi-dimensional approach to problem understanding and in evaluating the same with the advanced method. Rigorous research and well-written content by our tutors help you to get the good grades like never before. Our mentors have an eye for detail and believe in clearing every error of doubt whether it is simple or complex. EssayCorp has been in this field for many years. It adapts to students customized requirements in terms of presentation, process flow and also accommodates students to revisit for improvements. Our proficient writers work sets highest standards in terms of data collections, correlating information, analyzing the data model to sum it up to result in a flawless, well-presented assignment which is sure to give the extra marks. And on the basis of the research and after they are satisfied, they initiate your project, simultaneously following the particular criteria you have mentioned. They use proper referencing as required by your university. They use citations like APA, Harvard, MLA or any other as per your specifications. Moreover, before delivering an assignment, our professionals do a number of proofreading on the topic to make it error free. We also provide assistance on homework help, thesis, and essay writing etc. Avail our ER diagram assignment help to excel in your academics and get superb grades than ever. Grab this opportunity and open yourself to a whole new world of possibilities. Assignments related to database are tough to go through and E-R Diagrams being the ones that need someone to understand it to the core. The inclusion of software makes it the one to be handled more diligently. Student often face such difficulties with the assignments that has an involement of E-R Diagrams specifically as they perhaps has less knowlege on the subject or may not be aware of the fundamentals, which in turn results in poor grades. EssayCorp has database management experts who are experts in E-R diagrams drawn in a particular software as asked by the Universities. A copy of the the software file and the screenshots is shared to ensure that it is done accurately. 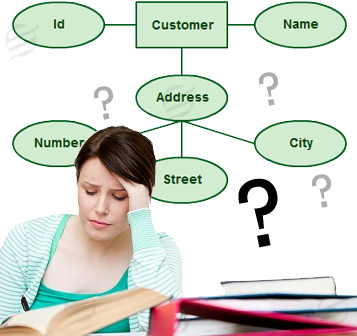 Avail E-R Diagram help from EssayCorp and reduce your assignment anxiety! Wider view and consider how some of the ideas you saw on virtual and augmented reality might change the media industry. Will it lead us away from television to watching on line. Will we be able to develop a more knowledge-driven society where we can see and hear and read multiple streams of information.I want to read your thoughts about the future. Apply the concepts of health promotion and illness prevention in the laboratory setting.Explain the rationale for selected nursing interventions based upon current nursing literature.